Vanna White meets Michael Sellick, Daniel Zondervan of The Crochet Crowd. 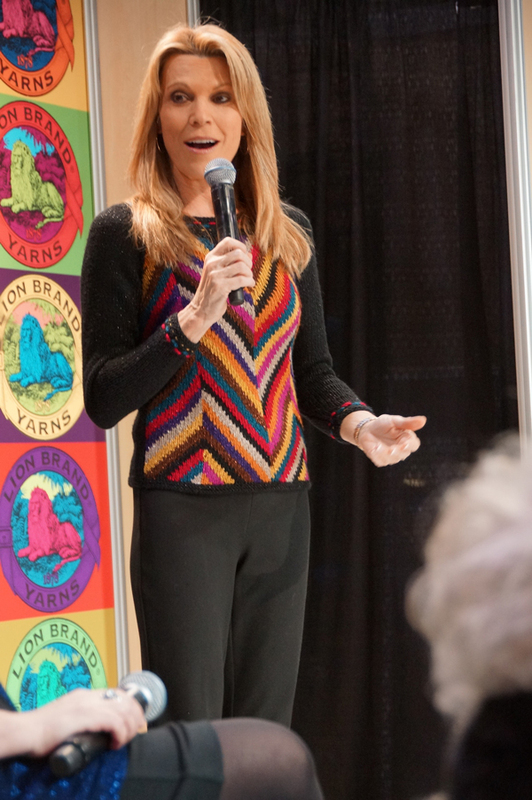 Remember that gorgeous hand knitted sweater Vanna White was wearing at CHA in California? We do and how can we forget! It was gorgeous… Vanna is too for that matter! We put in a request to Lion Brand to find out where that pattern is as it was brand new! Without delay, Lion Brand got the pattern online and even better… It’s a free pattern too! Sorry crocheters, this is knitted. This sweater is using Vanna’s Glamour® Yarn. I keep using the word exquisite, amazing and over the top gorgeous today… but this yarn just brings this out in me. I will say though, in person, this sweater is vibrant and alive. This entry was posted in Adult Clothing, Lion Brand Yarns and tagged 2014, crochet crowd, Free Pattern, Knitted, Lion Brand Yarn, Mikey, New, Pattern, Sweater, Vanna White. Bookmark the permalink. I took a peak at the pattern, and if you know how to “knook”, I believe it could be made that way. Not sure though. Where do I get the charts from? I need the XL. I see the four sizes at the edge of the page but the cursor doesn’t work on them. Can you help me please? I thought the same Paige. I’ll have a go when I get my WIP pile down a bit. It gives me the encouragement I need to learn to knit. Absolutely beautiful! Gives me the encouragement I need to continue learning to knit! Absolutely beautiful. Mikey, do you knit? I have only the basics so far… Maybe the crochet crowd can expand to have a knitters club LOL – You do everything else. What fun it would be to understand my knitting and stitches better. You would help, right? Mikey, do you think in your “spare time” you could devise a crochet pattern for it as well? I bet Lion Brand Yarns would love it too!! !